I have a lot of respect for Doug Naylor and the rest of the cast and crew of Red Dwarf, but unfortunately there's no getting away from the fact that this was ultimately a sub-par bit of science-fiction TV. 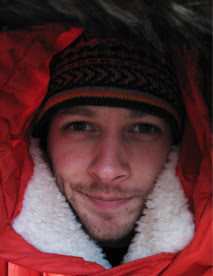 Naylor has ways been about making people laugh first, and worrying about story, characters and science fiction, second. His book, Last Human, and his two series were the same, so it doesn't come as a complete surprise. Sadly, despite his apparent best efforts to improve these short-comings, he still lacks the ability to tell a good story or allow characters to be themselves. As usual there were funny moments, and his punchy dialogue still hit the mark at times ("There's something bigger than God heading for you!") but attempts at anything else fell flat. For instance, the characters, after an initial opening dialogue from Rimmer (that actually did sound like Rimmer) all characterisation attempts floundered. We saw Dave Lister crying over the grave of his apparent lost love, Kochanski. It should have been a moving moment, and, indeed, Craig Charles got a chance to show just how far he's improved as an actor over the years, but it still felt very forced and unnatural. There was little or no connection with the character's pain. When it was time for the science-fiction aspects of Red Dwarf to appear, similar failings were revealed. A giant squid monster that, for example, wasn't in any way scary or threatening. The sudden appearance of another hologram, with only a single apparent attempt from Rimmer to vaguely ask where she was from. Instead of the crew suddenly being incredibly suspicious and confused, they suddenly focus on whether they liked her or not -- a double-whammy of failure in terms of characterisation and competent sci-fi. Of course she's not going to turn out to be who she said she is. Even reduced to terms of plain story-telling it's unfortunately very obvious and clichéd what is going to happen. The ending was perhaps the worst moment of all. I suppose we, as viewers, were supposed to go, "Oh my god! They've opened a portal to Earth!" But instead there was little shock or even any reason to care at all. I don't want to spoil anything for anyone reading this, but: They're going to go back to Earth. 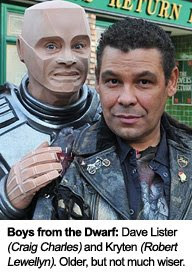 Hilarity will ensue (especially with regards to Kryten and Rimmer). Lister will find Kochanski and ultimately there'll be a plot device that means they'll all be forced back on Red Dwarf - but happy. The entire episode could have been condensed into something much more potent and interesting that allowed a storyline to be set-up on this new "Earth" (which could have allowed the creation of a decent cliff-hanger, too). Naylor is undoubtedly a funny comedic writer. I've always said that he's fantastic at his one-liners. But unfortunately a show can't rely solely on one liners, however funny they are, and especially not a science fiction one. In this regard Naylor needs help from somebody with talent for structure, characterisation and plot. Even if it's not Rob Grant, it's clear that he still needs a helping hand from someone with taltents to complement his own. Anyways, this is all a moot point, now. 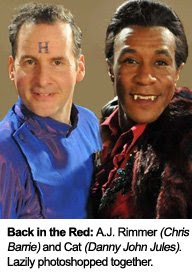 Red Dwarf is over. There will be no more TV shows. It's been a great 30 years and I hope the cast and creators have had as much fun making it as we've all had watching it. It's ultimately enhanced my life over the years and it will always have a special place in my heart. Thanks Rob and Doug. It's been a blast. Why the hell wasn't there a laughter track? Totally agree with you on Doug Naylor, but then Rob Grant's 'Backwards' novel was brilliant. It's a shame they split. I don't know how the hell I managed to miss this, but you made me glad that I did. How incredibly lame. I'll just ignore it like I do "Serenity", so that in my mind, they're still off somewhere having Wacky Space Adventures.